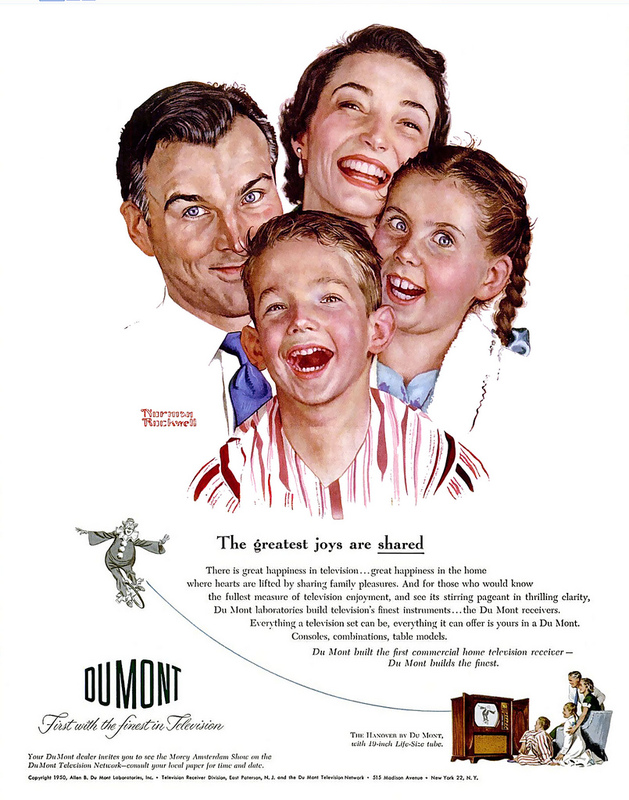 The DuMont Network survived precariously from its founding in 1946 until its ultimate demise in 1955. The racial dynamics of the post-war US, in which Jews rose to dominance over the native white inhabitants, was a major factor in DuMont’s failure, despite Allen Du Mont’s apparent philo-Semitism (a native New Yorker, he employed some Jews in top positions). Indeed, to grasp the duration of anti-white propaganda to which the American populace has been subjected via the all-pervasive medium of television, check out this propaganda spot [1:09 mins.] from DuMont’s popular Captain Video and His Video Rangers TV show in 1949. Note how the anti-white message is framed in reverse, or “positive” terms. A careful examination of radio programming and motion picture content from the time of their inception would reveal a similar pattern. Allen Du Mont, was born in Brooklyn, New York and lived just outside New York City (in northern New Jersey) his entire life. He became intensely interested in the technology of early radio as a boy, and developed into an accomplished electronics technician, scientist, and businessman. 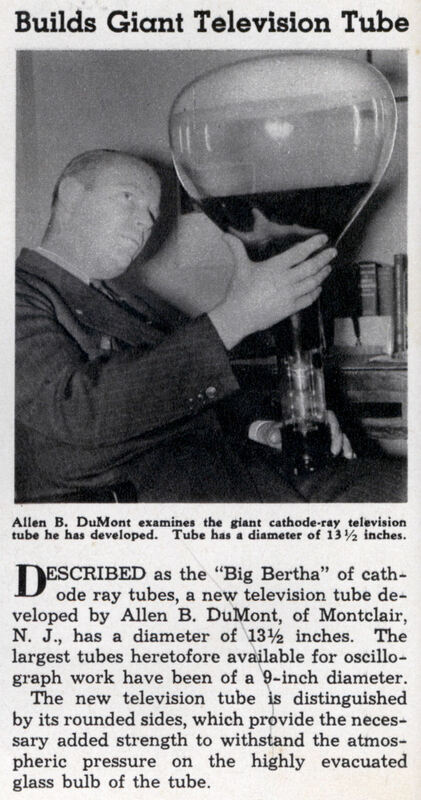 A brilliant inventor, Du Mont was credited with perfecting the cathode-ray tube. His long-lasting tubes ultimately made television broadcasting feasible. After producing radio tubes at Westinghouse, Du Mont became a vice president at De Forest labs, working with company founder Lee De Forest, the legendary radio engineer and inventor. When De Forest sold the firm to David Sarnoff’s RCA in 1931, Du Mont quit and founded his own company, New Jersey-based Allen B. DuMont Laboratories, Inc., during the depths of the Great Depression. At DeForest, Du Mont had been exposed to the mechanical television system of C. Francis Jenkins, and participated in the first television transmissions from W2XCD in Passaic, New Jersey. But, rejecting mechanical in favor of electronic television, Du Mont turned his attention to improving the cathode-ray tube. Initially, DuMont Labs built and sold high-quality tubes for use in oscilloscopes, devices for showing waveforms that produce a visual record of an electrical current on a fluorescent screen. Oscilloscopes were used to test electronic equipment. 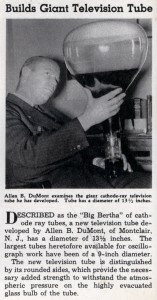 The cathode-ray tube became a core component in television sets, leading to Du Mont’s involvement in TV manufacturing and network broadcasting. In 1937, DuMont applied for its first permit to build a television station. The next year it began manufacturing television receivers. In November 1940 DuMont inaugurated its first television station, New York City’s experimental W2XWV (later WABD and WNEW). At the time, the city had only one other TV station. DuMont continued to own and operate its New York station as WABD Channel 5 after WWII. This, plus two stations in Washington, D.C. and Pittsburgh, served as the foundation for a nationwide network with affiliates in most major markets from New York to Los Angeles. 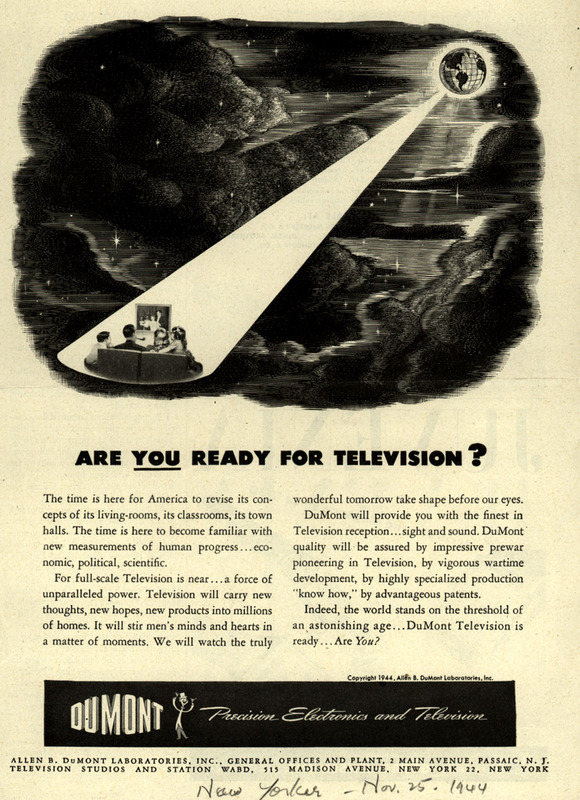 In 1946 DuMont launched the DuMont Television Network. The same year the company and NBC simultaneously aired the first regularly-scheduled television broadcasts, consisting of a few hours of programming three or four nights a week. Allen Du Mont ultimately created and oversaw three separate businesses: DuMont Laboratories, a television manufacturing business, and the DuMont Television Network. During the late 1940s and early 1950s, such DuMont programs as Captain Video and Cavalcade of Stars—the variety show on which Jackie Gleason introduced The Honeymooners—were notable offerings. The popular Life is Worth Living featured Roman Catholic Bishop Fulton J. Sheen, a strong anti-Communist and critic of Freudianism. The Ernie Kovacs Show, not well-liked in its day, is now considered a classic by many. Despite its pioneering role in commercial broadcasting, by 1955 the DuMont network was out of business and its founder and namesake forced to relinquish control of the company he’d spent a quarter century creating. Historical accounts indicate that the limited supply of advertising dollars and entertainment talent (actors, writers, producers, directors) created an oligopolistic market structure capable of supporting only three television networks. In addition, the three Jewish networks, unlike DuMont, developed more or less naturally out of pre-existing, solidly-entrenched, massive broadcasting companies created by TV’s predecessor entertainment industry, the Golden Age of Radio. The industry’s behemoths were CBS, owned by William Paley, and NBC, run by David Sarnoff—both Jews—leaving DuMont and Leonard Goldenson’s ABC to fight for third place. DuMont Laboratories also manufactured DuMont-brand TV sets, the best receivers money could buy. In fact, television manufacturing long remained the company’s primary profit center. But by the mid-1950s DuMont’s highly successful manufacturing line—DuMont TV sets were considered the Cadillacs of the industry—declined as a source of revenue as the company succumbed to high-volume, low-profit sets produced by competitors like GE, RCA, and Westinghouse, with which DuMont could not successfully compete. Du Mont, a born scientist, was deeply absorbed in the technical aspects of television broadcasting and receiver (TV set) design, development, and manufacture, but displayed virtually no interest at all in programming, which he left entirely to others. It is very strange that whites are so often completely oblivious to or uninterested in such crucial matters, displaying no evident desire to manipulate or control others, but instead focus their fascination upon the minutiae, mechanics, or technical aspects of things, while Jews instantly and tenaciously seize upon any characteristic that will enable them to dominate others. For it is programming that shapes, and ultimately controls, the mass mind and society. Of course, programming never exists in isolation from the technological, business, political, racial, and legal infrastructure that makes it possible. From a psychological and behavioral perspective, Allen Du Mont was far more reserved and private than the Jewish executives at other networks, which doubtless hobbled him in the cutthroat TV industry. While not all whites are as honest as the day is long, it is true that as a group they tend to display traits similar to Du Mont’s, whereas Jews more closely resemble Du Mont’s network competitors. Moreover, Jews follow a dual moral code: one set of rules for themselves, and another for us. Governments and elites follow suit. This creates a grim dilemma not only for white businessmen, but for mainstream politicians, intellectuals, journalists, and white nationalists as well. Arabs and Muslims are nowhere near as brutal and violent as Jews. But Jewish animosity, self-centeredness, injustice, and recalcitrance inevitably drives all but the most determined and unyielding from the field. Non-Jews who exhibit fairness, justice, or honesty are brutally and unceremoniously stomped into a bloody pulp. As a consequence, there is probably no “nice” way for whites to assert their right to survive. Jews, utterly self-absorbed, will never permit free discussion, association, or peaceful democratic change. It is not in their nature. That is why morally unscrupulous, ruthless, and frequently dishonest characters like Adolf Hitler, George Lincoln Rockwell, and William Pierce are the most likely to succeed if anyone does. Jews choose, through careful selection and rejection and rewards and punishments, the personnel of government, academia, and the media. But they also choose the character and tactics of their foes. Any who are “nice,” fair, trusting, naïve, or attempt to live by the rules are mercilessly crushed by the hate-filled “children of G-d.” Eventually men come along who simply face the fact that the rules are not being obeyed and never will be obeyed, that justice is not done and never will be done, that the truth does not matter and never will matter—and engage the enemy on his own terms. It did not matter that Allen Du Mont harbored (apparently) no animus against Jews or other non-whites. He was crushed anyway, in part because he was white. Du Mont’s ethnic odyssey paralleled Lee De Forest‘s (p. 12) in radio and Philo Farnsworth‘s in television. Secret anti-white animus and distrust, plus absolute refusal to share power, played a major role in sealing the fate of all three men. The two major networks, NBC and CBS, had powerful lobbyists who would walk right into the offices of the FCC or the halls of Congress and unashamedly dictate regulations or rulings or legislation that openly favored NBC and CBS, while making it difficult for ABC and impossible for DuMont to expand. ABC survived by forging strong ties to Hollywood studios, but an earlier alliance between DuMont and Paramount was nothing but complete disaster for DuMont. In 1953 Goldenson’s ABC merged with United Paramount Theaters (not to be confused with DuMont’s problematic partner Paramount Pictures), and the resulting infusion of cash revitalized the rival network. DuMont, already losing ground to CBS and NBC, was further hamstrung by ABC’s resurgence. It was at this point that Leonard Goldenson approached Allen Du Mont and his Jewish factotum Ted Bergmann to propose a merger—in effect, a takeover of DuMont by ABC—so that the two networks could more successfully compete against CBS and NBC. Goldenson offered to pay $5 million dollars, acquire all of DuMont’s network commitments, and use the name ABC-DuMont for at least five years in order to provide advertising for DuMont’s set manufacturing business. With Allen Du Mont’s approval, Bergmann worked out a deal for ABC to acquire the network, but DuMont’s Hollywood shareholder, Paramount Pictures, vetoed it. Paramount [Pictures] staged a coup d’etat in August, 1955, and at last took complete control of DuMont. By teaming up with the [Wall Street] investment firm of Loeb & Rhodes (another major DuMont stockholder), Paramount obtained a working majority of stockholders and instituted immediate changes. Dr. Allen DuMont was kicked upstairs to the meaningless position of chairman of the board, and Bernard Goodwin (a Paramount man) was installed as president. Soon thereafter, DuMont announced that it no longer considered itself a national television network. When all of this was going on, I remember sitting in [Dr. DuMont’s] study in his house, just the two of us. It was all coming apart at that point. We were having a drink before dinner, and he started to sob and said, ‘I can’t let them take my company away from me. I can’t let them do this.’ Then he recovered his composure, but they did take it from him. The new controllers spun off DuMont’s television stations into a separate entity, DuMont Broadcasting Corporation. In 1958 Jewish media mogul John Kluge purchased the firm, renaming it Metromedia. In 1986, Kluge was named America’s richest man by Forbes magazine. That was the year Kluge sold Metromedia to Rupert Murdoch, who used Metromedia’s stations as the nucleus for what would become the Fox Broadcasting Co., the first new American network since DuMont’s demise three decades previously. DuMont’s demise triggered a 68% rise in advertising revenues at ABC the year DuMont went out of business. DuMont’s television manufacturing business was sold to Emerson in 1958, and DuMont Laboratories merged with Fairchild Camera and Instrument in 1960. 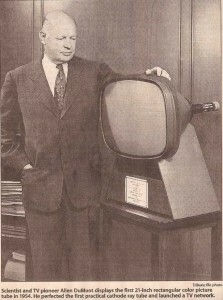 Some TV sets and other products bearing DuMont’s name continued to be manufactured by Emerson and Fairchild into the 1970s. Dr. Allen B. Du Mont served as group general manager and senior technical consultant at Fairchild until his death in 1965. The demise of the DuMont Network and the concurrent rise of ABC established once and for all the CBS-NBC-ABC television oligopoly that ruled the United States for the next thirty years. In the 1940s and ’50s, prior to the advent of videotape, the only way of preserving television programs was by means of kinescope recordings. Kinescopes were made by placing a motion picture camera in front of a television monitor and recording the image off the screen while the program aired. The fuzzy, grainy, distorted films so created were then shipped to TV affiliates in cities and locales outside the reach of the original station’s antenna, which in the early days was typically located in New York City, where most programming originated. In addition, kinescopes were retained for archival purposes. Many DuMont shows were originally preserved on kinescopes. These kinescopes were stored in a warehouse until the 1970s. Reportedly, so little value was given to the films that the stored kinescopes were eventually loaded into three trucks and dumped into Upper New York Bay. Although nearly the entire DuMont film archive was thereby destroyed, an estimated 400 kinescopes did survive, some of which have been released on DVD. Though now long-forgotten, in the late 1940s and early 1950s, the name DuMont was synonymous with the new medium of television. Published: May 4, 2012 | This entry was posted in North American New Right and tagged Allen Du Mont, Andrew Hamilton, television, the DuMont Network, the Jewish question. Both comments and trackbacks are currently closed. Well, I understand what you’re saying. In crucially important ways they were the most honest—about race, racial survival, and Jews. Once free thought, discussion, and debate have been shut down, and no other route left open, you descend into a cutthroat world in which even friends and allies are deemed exploitable, expendable, disposable—for the “greater good,” of course. Do you have examples of where Hitler & Dr. Pierce lied? The SBT television network in Brazil is owned by the Abravanel family. The long-range effects of this campaign are even now evident. It is producing the “spineless citizen”: the man who has no cultural sensibilities; who is incapable of indignation; whose sole mental activity is merely an extension of what he reads in the newspaper or sees on the television screen; who faces moral disaster in his neighborhood, political disaster in his country, and an impending world catastrophe with a blank and smiling countenance. He has only understanding for the enemies of his country. He has nothing but kind sentiments for those who would destroy his home and family. He has an earnest sympathy for anyone who would obliterate his faith. He is universally tolerant. He is totally unprejudiced. If he has any principles, he keeps them well concealed, lest in advocating them he should seem to indicate that contrary principles might be inferior. He is, to the extent of his abilities, exactly like the next citizen, who, he trusts, is trying to be exactly like him: a faceless, characterless putty-man. Along with everyone else, American Catholics have been hammered with the slogans of the “anti-hate” campaign. Additionally, they remember the stories of how prejudice against Catholics oftentimes made America a very uncomfortable place for their immigrant Catholic grandparents. And so, they too, if asked, would declare unhesitatingly that hate should be outlawed. One might quip that if Whites don’t have a television network, and the Jews have many, it’s because Whites don’t practice ethnic networking and the Jews do. I don’t how you select your topics, but you are always coming up with original and creative ways of examining the issues. Revilo P. Oliver said something to the effect of “if White people were even a fraction as ethnocentric as Jews, they would own the world.” That is a crude paraphrase from memory, but it conveys the gist of Oliver’s point. In other words, Jews got key help from White Gentiles in the government. There is no reason it could not have gone the other way. The halls of Congress have always been dominated by White gentiles. If they were even mildly ethnocentric, it would have. Jews would have been the ones forced out. I’m not suggesting these outcomes are “our fault” or that “we did it to ourselves,” but it’s frustrating watching this pattern repeatedly turn up throughout history and play out over and over again. I believe Jews got rid of Ted Turner, too. There is probably an interesting story there. Ted Turner was an anti-White multiculturalist and a liberal, but he was still a Gentile and thus unacceptable from a Jew standpoint. I think you’re right about Ted Turner. I believe he made a run at CBS at one time. So did conservative Senator Jesse Helms. That really caused paranoia among the Jews. Helms obviously understood the importance of the underlying principle. But, from their reaction, so did the Jews. Helms at one time spoke out against US foreign aid, including aid to Israel—one of the few congressmen ever to do so. After being viciously attacked and nearly losing an election, he reversed himself 180 degrees and became a militant Zionist-internationalist. As a footnote to readers, I love the visuals to this article! If you click on them you can enlarge them, view them in richer detail, and read the fine print. Revilo P. Oliver wrote in “Before Midnight” (Liberty Bell, September 1989): “If Aryans could develop even a small fraction of Jews’ racial cohesion and solidarity, they would soon own the planet.” He may have made similar comments in a few other articles. Lew, you beat me to it. Last night I was thinking about more recent cases where Whites had no urge whatsoever to help other Whites. Ted Turner was one case, but there’s also John Reed at Citibank and Steven Case from AOL. Think of the stories that could be written about this IF THEY TIED TOGETHER THE JEWISH ETHNOCENTRISM ANGLE. And then you could publish them . . . er, well . . . on the Internet, I guess. Finally, I must agree with you that Mr. Hamilton has a fascinating way of selecting his topics. I look forward to Friday every week just to read his articles! Is he a friend or a fiend. The honour fled,the guile came. Well, I guess I am a useful idiot. I was usually cast as the fool or the devil’s advocate without fully realizing the implications of that. Oh well. C’est la vie. LOL. As Hitler says in Mein Kampf, one of the problems the Germans had was not learning from the enemy with regards to how to use propaganda. When you allow the enemy let doubt into your psyche, you have lost. ( Chapter Vl War propaganda.) Ah, but we are so trusting and nice and kind. We think others are like us. NO THEY ARE NOT! Another thing I know from experience is that the enemy of my enemy is not necessarily my friend. Ah sweet despair, what a teacher! There are not many people who honour each other’s ‘word’ as in making one’s word binding to an action. I do believe that that is a white thing. One’s word is one’s honour. Ha, when do we see that? Don’t make promises you cannot keep. Personally, I would rather have a ‘no’ than a ‘yes’ that is not honoured.